This game can take place wherever there is space and it is not the movement of cars or other things. The game, defend the gate, implies that the player who has the ball in the hand removes from the game another player who is with the lateral feet at shoulder level. You can play more in this game, but in order not to be boring, we recommend up to 10 people. a ball, or any size ball of the soccer ball, but be easy. Find a suitable space, and search for up to 10 people for this game. All players will form a circle. They will have their legs uncovered later. The legs have to be glued to each other in order not to leave space among the players. Make sure you’ve explained all the rules so that those who play understand what they have to do. If this game is organized in the summer, it is desirable to be somewhere in the shade. The space you need is about 4 square meters. Step 1: Forms the group of participants with a number of 5-10 people. Communicate what the purpose of the game is and also tell them what the rules are. It is necessary to play in a place where there is not much crowding and movement. Step 2: Mark the place where the game takes place and arrange all the players in a circle. Each of them must have legs apart laterally and glued to the neighbors’ feet. For example, the right foot should be attached to the left foot on the person on the right and vice versa, the leg left to the right person on the left. This is done in order not to leave space between the players to pass the ball. Step 3: A player is given a ball. His goal is to eliminate the opponents from the game by throwing the ball between their lateral legs. This is done by throwing the ball with the hands between the opponents’ feet.The one who throws the ball has no right to remove the person to his right and left. Those who do not have the ball have to defend their hands by placing them between their lateral legs. So it will be that every player has his gate and has the right to defend it only with his hands and with nothing else. Step 4: If a player drops the ball between his legs, he has the right to defend his goal with just one hand and if he misses the ball once again he is removed from the game. Step 5: It plays so only 2 players are left behind, after which they compete with each other. Their position is exactly the same as at the beginning with their lateral legs removed just as they already are, the players face the front at a distance of about 1 meter. 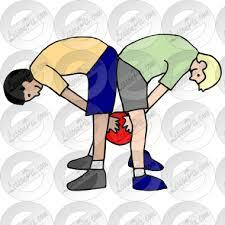 The one who drops the ball between the two legs is eliminated and the other is considered the winner. Attention is the factor that helps you for the most part and it is good to be conceived throughout the game. Be very careful when you do not have the ball in your hand to defend your gate. Even if you drop the ball once in your legs, you have a chance to play with one hand and become a winner if you eliminate all your opponents.